His current bandleader is 49-year-old Howard Glazer who began his musical career at the tender age of 13. He first came to prominence working with Harmonica Shah with whom he recorded two CD�s on Blue Track and Electro-Fi. In 2004 he released �Brown Paper Bag� on the Random Chance label and was rewarded with tours of Canada, Japan, Australia and Europe. I was impressed by his video link acoustic performance and have persuaded him to play an acoustic slot in Castor. 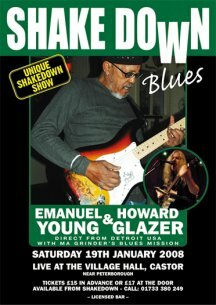 Local musicians under the banner of Ma Grinders Blues Mission joined them at Shakedown Blues in a couple of informal and highly exciting jam sessions.